"Best New Product of the Year"
#1 on Earth for Two Decades. NASA Dubbed It "Touch-Free Soldering"
So Ahead of Its Time! Ideal With Microscopes. An Essential Soldering Tool! 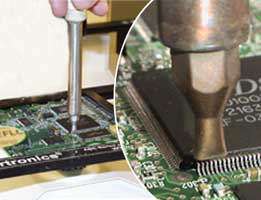 The patented ZT-2-MIL Hot AirPencil™ is essential for SMD soldering. 20 years on the market. Still the most popular touch free, precision soldering tool on earth. Differentiation! The hand-piece is slim as a pencil, not a hot air tool packaged inside an oversized bulky handle that obstructs a tech's vision from tiny chips being soldered. It's the true air "pencil". 100% Non-Contact! It is a "touch-free" safer method for soldering thermally sensitive IC's, SMD's and delicate ceramic capacitors, glass diodes . ZeroTouch™. 100% Non-Contact! It is a "touch-free" safer method for soldering thermally-sensitive IC's, QFP's, PLCC's, SOIC's and delicate ceramic capacitors, glass diodes and tiny SMD resistors. Precision Temperature Control. With closed loop feedback and a variable temp dial and a variable air flow dial, technicians control with even ultra-light settings for tiny chips. The ZT-2-MIL has a safe, low 24-volt featherweight hand-piece with an integrated 'pencil holder' centered in the design (for right or left hands). Plus it features; self-contained air: no air hook-ups!and a rugged steel ESD-safe case. a.) Zero opportunity to bend/deform delicate SMD leads! Zero chance to scratch/ruin fragile pads -- a common occurrence with soldering irons. b.) Unlike contact soldering iron tips, the ZT-2 does not cross-contaminate PCB's with varying solder alloys, varying fluxes, dirt, grime or adhesives! c.) Works with Lead-free (RoHS) or traditional tin/lead solders as it never contacts the pad and/or solder unlike traditional soldering tips which must be always segregated at a bench. d.) With the AirPencil™, there is no accidentally bumping or moving your carefully placed SMD which is also a drawback with the soldering iron which can misalign the chip after it is placed because it contacts the chip. e.) The AirPencil™ excels where traditional soldering irons fail in preparing or "touching up" pads. While contact irons can leave unwanted tags or "ice-cycles" compounding co-planarity problems, the hot air pencil hot levels and leaves a smooth pad. f.) Soldering irons damage ceramic chip capacitors, glass diodes (especially 0201's, 01005's) by sudden immediate high temperature contact directly to the tiny devices setting up unequal thermal expansions between the chip and its leads causing micro-fissures! Soldering irons historically cause quality issues, with cracking and fissuring caps and diodes. Look at those "soldered" chips by X-Ray. The ZT-2 virtually eliminates this problem. For ZeroTouch™ you want the ZT-2! Solder Ceramic Caps & Glass Diodes With AirPencils™ Instead of Soldering Irons. Stop Thermal Shock & Chip Cracking. The ZT-2-MIL's Unique 3-Turn Air Velocity Dial. Extra Control for Tiny Chips and Solder Paste. 1) The system delivers up to 530ºC at the AirTip™ exit, yet powered by only an extra-safe, extra-low 24 volts (Be sure to investigate the high voltages of our so-called "competition"). 2) It's featherweight, pencil-thin hand piece is, to our knowledge, the lightest and thinnest AirPencil™ ever, making soldering a joy, not a drudge. 3) Our precision air velocity control dial has 3 full rotations extra fine adjustments -- separating it from all other high-velocity so-called "hot air tools" which can and do blow tiny chips away and/or scatter solder balls up under IC's. Our unique 3-turn dial puts you in control while you work. 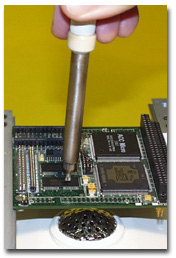 The AirPencil™ & Solder Paste: A Great Combination! With our extra low air velocity, work with confidence and success with solder paste making high quality solder joints with fillets at the toes, heels and sides of the SMD's. Experience the difference! Yes, solder paste at the bench? Want to see how to use the ZT-2-MIL AirPencil™? Our Color Pictorial Process SMD Soldering With Paste is Easy. The ZT-2-MIL belongs at every work bench where critical PCB rework is performed. For enhanced results, we recommend that it be used in concert with any of our world-famous ZT-1 AirBaths™ for quality thermal profiles through pre-heating. 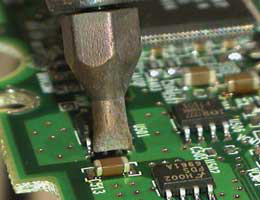 The ZT-2-MIL Belongs Where SMD Soldering Is Performed. Over 22 Years Solid History! 1.) Zero Level Static: The ZT-2-MIL was evaluated by Motorola's ESD Lab and was the only hot air tool to qualify for its extra-tough standard of "Zero Static Level" for space applications. Just so superior. 2.) Ultra-Skinny Profile: You Can See The Chip You Are Soldering! The AirPencil™ is the sleekest, pencil-thin profile on the market. 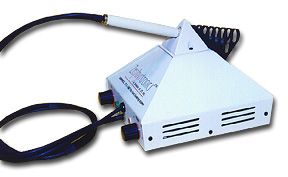 Other manufacturers crudely re-packaged hot air tools into their existing large, bulky solder iron handles that obstruct vision to SMD's (chip caps, resistors or chip scale size packages). One can not "see around" such goofy designed tools. Just so superior. 3.) Extra Thin, Ergonomic & Feather-Weight Hand-Piece! Our patented ZT-2-MIL is a real air "pencil" affording essential visibility to very tiny chips when soldering. With the ZT-2, yes, you can still see your chip! 4.) Only 24 Volts in the Handle! Most other hot air pencils require techs to wield high voltages of 120 or up to 240 Volts in their hands. Yikes! 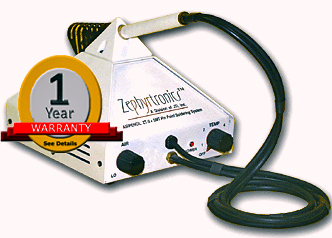 The ZT-2-MIL easily reflows even high temp, lead-free solder alloys with ease with only 24 Volts! How? Our effective internal air heating chamber agitates air providing up to 510°C at the exit point of the AirTip™ at the maximum setting. While we don't think one should solder at those temperatures, but we want to assure you that a properly engineered 24-volt tool can deliver all the punch that those high voltage tools do. Just so superior. 5.) Variable Air Flow With a Truly "Ultra-Light" Range! Our precision air velocity control dial has 3 full rotations for the finest of adjustments ---separating it from all other high-velocity so-called "hot air tools" which can and do blow tiny chips away during reflow and/or scatter solder balls beneath IC's. Just so superior. A Wide Selection of Air Focusing Tips Are Available: Unlike traditional soldering "tips" which oxidize, the ZT-2-MIL utilizes long life stainless steel Air Tips including the popular Oval Air Tip which, by the way, ships out standard with each system. A selection of 5 styles of these very affordable Air Tips are available from Zephyrtronics. Plus, every ZT-2-MIL AirPencil™ System comes with a set of two non-magnetic, stainless SMD steel tweezers for cool chip replacement and removal. The AirPencil™ Used By NASA & JPL! 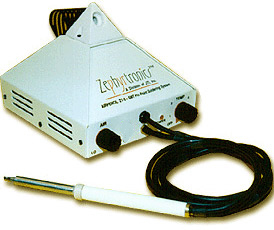 Yes, the ZT-2-MIL AirPencil™ is the very same one used at NASA and JPL for soldering on the two successful 2003 Mars Rovers. Eliminating any potential for excessive hand pressure on high reliability boards and eliminating any potential contamination of the PCB, the ZT-2 is essential for quality work. Non-Contact Reflow Soldering for SMD's. Closed Loop & Zero Cross Switching. Variable Air Flow and Temp Settings. Precision, Pin-Pointed Heated Air Stream. Reflows Individual Component Leads Only. Engineered & Manufactured in the U.S.A.
For more information, refer to Technical Papers, "The Hot Air Pencil:™ History & Theory of Making Quality Solder Joints at the Bench" and our color pictorial process page "Quality SMD Soldering at the Bench". Fully MIL-Spec Compliant and Approved for Space Applications! ©1996 - 2011, 2012, 2013, 2014, 2015, 2016, 2017, 2018, 2019 by Zephyrtronics®. All rights reserved. The information, text, images, photographs, charts, graphs you receive online from Zephyrtronics® are protected by the copyright laws of the United States. The copyright laws prohibit any copying, redistributing, retransmitting, or repurposing of any copyright-protected material. 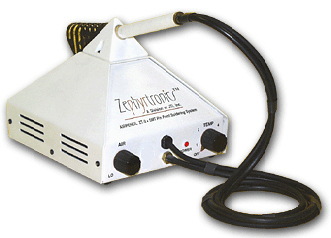 Zephyrtronics is the registered trademark property of JTI, Inc. "The Science of Zephyrtronics" and "Simplicity Through Innovation" and "Zephlux" and "ZeroLead" and "Zero Balling" and "Zero Residue" and "Post Cooling" and "Post Cooler" and "AirBath" and "SolderGlide" and "SolderMill" and and "ZeroTouch" and "STILL Made in the U.S.A." and Just "So Superior" are the protected trademark property of JTI, Inc. "Zephyrtronics" and "Low Melt" and "Air Fountain" and "Fountainhead" are registered trademark properties of JTI Inc. *The above names are the registered property of their respective owners.